In addition to precious aromatic seeds, some varieties of fennel (Foeniculum vulgare) produce a meaty, tightly-wrapped clump of white and green leaves known as bulb. Fennel bulbs come from the famous Florence fennel cultivar, also known as sweet fennel, and are a good source of vitamins A and C, folate, iron, copper, potassium and phosphorus, nutrients with a beneficial effect on skin and bone health, but also important for good digestion and immunity, hormonal balance and circulatory health. The good nutritional content of the vegetable as well as the high concentration of aromatic essential oils with potent antibacterial and anti-fungal properties make fennel bulbs a genuinely healthy food. The aromatic components in the vegetable, responsible for its unique flavor, add to its benefits, further increasing its nutritional value and recommending it for consumption. What does fennel look like? Fennel is a beautiful, tall vegetable, reaching 2.5 meters in height. It has long, hollow green stems with deep green fine leaves and clusters of bright-yellow tiny and highly aromatic flowers. The flowering fennel plant looks almost identical to dill while fennel seeds are quite similar in flavor to star anise and anise, although less aromatic. The bulb part however is only present in Florence fennel (or finocchio), a variety grown for the purpose of yielding a meatier vegetable, more suitable for human consumption. Fennel seeds, flowers, stems, leaves and bulbs or roots are all edible. Fennel bulbs are basically bigger, larger clumps of tightly-wrapped leaves at the base of the plant. The bulbs are almost entirely white, except for the areas where the bright green stems arise. In cooking, they are used fresh or dried. What do fennel bulbs taste like? Fennel bulbs take on the distinct fennel seeds flavor but are somewhat sweeter. They are quite a versatile vegetable and can be used in salads, as warm side dishes or in stews, casseroles and so on. Raw bulbs are crisp and quite aromatic, while cooked ones are sweeter, mellower. What are the health benefits of fennel? 1) Helps you lose weight. Raw fennel bulbs have around 31 kcal/100 g so you can enjoy more than one serving of fennel and radicchio salad or roasted fennel with Parmesan and still lose weight. The trick is to try to substitute high-calorie, fatty side dishes with sweet, nutritious and savory low-calorie vegetables such as fennel bulbs. 2) Good for healthy bowel movements. 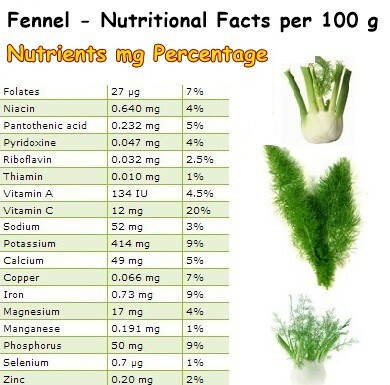 With 3.1 g of fiber/100 g of raw bulb, fennel is easy on the digestive system. Fiber adds bulk to stools and facilitates passing through the digestive system. This, in turn, prevents constipation, hemorrhoids and reduces the amount of time the colon is exposed to toxic compounds from stools (see what foods to eat and to avoid for hemorrhoids). Good to know: Eating raw fennel (or any other vegetable you can bear to eat raw) has an outstanding cleansing effect on the colon as well. Fiber and enzymes released from vegetables during chewing act directly on the intestines by improving gut motility and cleaning any old deposits attached to intestinal walls. 3) Helps digest heavy meals and reduces gas. Fennel seeds, bulbs, leaves as well as fennel tea all act as digestive aid and help relieve bloating, cramps and gas. Even more, eating fennel bulbs or seeds or drinking a cup of fennel tea after a meal is known to ease the digestion of heavy, fatty foods especially. The carminative (anti-flatulence) properties of fennel are attributed to its high anethole content. 4) Strong antibacterial and anti-fungal activity. Fennel owes its strong antibacterial and anti-fungal properties to a variety of essential oils, particularly anethole (50-75%). As an unsaturated (thus healthy) oil, anethole contributes to better immunity and to maintaining cardiovascular health. Other important essential oil found in fennel are estragole and fenchone. 5) Prevents bad breath. Fennel root and fennel seeds are a great natural remedy for bad breath. This is in part owed to the antibacterial properties of anethole, a strong essential oil found in fennel which is thought to act against odor-giving mouth and stomach bacteria. Chewing on some fennel seeds after you eat is a great way to help prevent halitosis or breath odors. However, if you are looking to get rid of bad breath permanently, then a good diet is your greatest asset. Research suggests that giving up smoking, junk food and adopting healthy dietary habits is essential for oral and digestive system health. 6) Good for immunity. Fennel contains a more than generous amount of vitamin C (20% of the RDA), a potent antiviral, antibacterial, anti-inflammatory and antioxidant agent. This means that regular consumption improves our body’s natural resistance to infectious agents by increasing the aggressiveness of white blood cells. Moreover, vitamin C supports collagen synthesis and thus constitutes an essential tool in maintaining the integrity of our blood vessels, internal organs and (wrinkle-free) skin. 7) Contains small amounts of iron, potassium, phosphorus and copper, essential nutrients which contribute to the formation of red blood cells, regulate body fluids and blood pressure, maintain healthy bones and delay aging signs such as gray hair and iris discoloration. 8) Contributes to maintaining hormonal balance. The anethole in fennel acts like a plant form of estrogen, an important female hormone. Consequently, fennel and fennel extracts are recommended as herbal remedies for treating hormonal imbalances, especially in young women. Conclusion. Overall, fennel is a nutritious vegetable with great health benefits. It has beneficial effects on body weight, digestion, immunity and hormonal balance which is why regular consumption is encouraged. Its distinct flavor makes it ideal for anyone who enjoys naturally fragrant, sweet and crunchy crisp foods.